Place yourself in the shoes of a pharmaceutical researcher who has identified an extraordinary drug candidate. When administered to tissue cultures on the lab bench, your drug strongly inhibits the formation of white fat cells. This could be a huge breakthrough in obesity treatment! Every test demonstrates that your drug candidate could be the next blockbuster. As you eagerly begin Phase I clinical trials, however, it’s noticed that your volunteers show negligible uptake of the drug through the gastrointestinal tract. The £1 billion project is promptly discontinued, and your much-hyped drug candidate falls by the wayside. Unfortunately, this scenario is all too common in the pharmaceutical industry. An excellent drug candidate in the lab rarely translates into a successful new medicine. This is best demonstrated by the fact that the clinical attrition rate during Phase I studies alone is around 35%, according to the Biotechnology Innovation Organization. A significant cause of this attrition is low dissolution rates in bodily fluids; around 40% of promising active pharmaceutical ingredients (APIs) suffer from low solubility.1 This results in low drug substance levels in the blood, and ultimately causes low bioavailability. This problem is only set to widen in scope as drug candidates become more complex. The decreasing bioavailability of more complex drugs is well described throughout the scientific literature. In 1997, US medicinal chemist Christopher Lipinski described his ‘rule of five’ for producing orally bioavailable drug candidates. Two of these rules state that drug molecules should avoid having a molecular weight larger than 500Da and should have no more than five hydrogen bond donors.2 As more and more of the small-molecule chemical space gets absorbed by marketed drugs, pharmaceutical companies are turning to larger, more complex drug molecules that break Lipinski’s rules and suffer in terms of bioavailability. Nanoform, a Finnish drug-enabling company founded in December 2015, investigates how to solve the problem of poorly soluble aqueous drugs. The company has developed an innovative nanonisation process to increase the dissolution rates of APIs – dramatically reducing their size to increase their surface area to volume ratio. The company’s proprietary, multi-patented technology, controlled expansion of supercritical solutions (CESS), is used to produce API particles of uniform size between 10nm and 2µm, enhancing their dissolution rate and bioavailability, and giving promising drug candidates the best chance of reaching the clinic. It is well known that increasing the surface area to volume ratio of a particle increases its dissolution rate,3 and various techniques are currently employed in industry to reduce the particle size of APIs. One category of these is mechanical methods such as milling, which are effective at producing particles in the low micrometre range. However, they are not effective at producing nanoparticles and may negatively impact APIs with low chemical stability. Other approaches such as spray drying, solid dispersion and extrusion may also be used, but often result in amorphous products without an identifiable crystalline form. 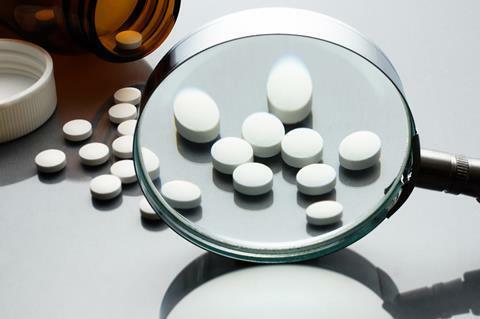 These techniques also frequently employ excipients – chemical additives used in order to promote particle formation – which may end up negatively impacting the administration of the drug. Another technique, widely used in the industry and dating back to 1987, is rapid expansion of supercritical solutions (RESS).4 In this process, APIs are dissolved in a supercritical solvent (generally carbon dioxide) under high pressure and temperature until the solution is supersaturated. Upon rapid depressurisation, the carbon dioxide returns to a gas state and the dissolved API immediately crashes out of solution, forming a large quantity of tiny crystal nuclei. These nuclei then grow by coagulation, the coming-together of particles through random movements. Generally, the faster the depressurisation, the smaller particles become. 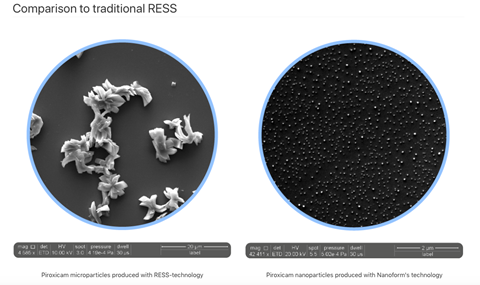 The problem with RESS is that it provides limited control over the thermodynamic processes of particle formation and growth, which may lead to particles with undesirable size and heterogeneous surface properties. Nanoform’s technique uses controlled expansion of supercritical solutions (CESS) to enable fine-tuning of the thermodynamic pathways governing nucleation and particle growth. CESS differs from RESS chiefly through the way in which pressure is reduced to induce precipitation. In RESS, this pressure drop is almost instantaneous, and crystal growth is fairly chaotic as a result. CESS uses a stepwise decrease in pressure to achieve thermodynamic control of precipitation, allowing the conditions that affect particle growth to be altered. The degree of supersaturation as well as the pattern of pressure reduction steps are used to control both the size of the nuclei that precipitate and the speed at which they grow. In CESS, API nuclei undergo controlled growth by condensation, whereby new API molecules are deposited onto the growing crystal – a process that is strictly avoided in RESS. The end product is API particles of controlled size with narrow size distribution. The smallest particles possible, though molecule-dependent, tend to be around 10nm. Generally, the production of API nanoparticles by this technique leads to a significant increase in dissolution rate, crucial for increasing the uptake of the drug molecule and enhancing its bioavailability. The whole process is a good example of ‘green chemistry’, as the only solvent used is carbon dioxide, and this is recycled continuously so that the entire process produces very little waste. The CESS process is not a one-size-fits-all method, and Nanoform performs thorough investigation to understand the unique conditions that every API will need in order to undergo successful nanonisation . 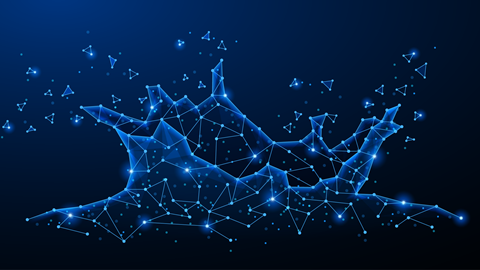 The company has used its experience of working with many different APIs to develop its Starmap database, which catalogues molecules based on their chemical properties such as hydrophobicity, functional groups and chemical structure. Placing a new API into Starmap gives insights into the feasibility of nanonisation and the different parameters the API will need in order to form uniform particles during CESS. As the database continues to grow it becomes ever more useful in understanding the behaviour of APIs undergoing particle formation. Although Starmap can act as a guide when working with a new API, optimising parameters and investigating results still rely on collecting empirical data. Starting with limited volumes, CESS settings are iteratively optimised to achieve the desired particle size and distribution. 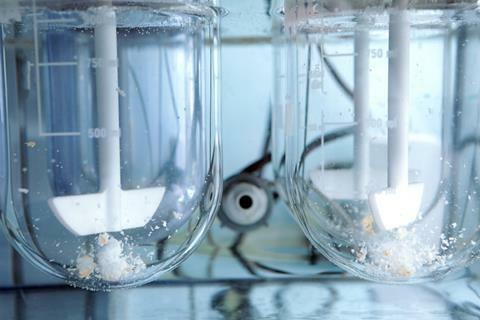 There is great opportunity throughout the process to alter conditions and affect the results, with the end goal of producing API particles that are ideally suited to the customer’s need. Once the perfect settings are found, the process can be scaled up to larger volumes. The main advantage of CESS technology is that it can produce particles down to 10nm with a narrow size distribution. This has been shown to greatly increase the dissolution rates and bioavailability of APIs compared to other methods of particle size reduction, and particles of such small sizes can even demonstrate increased solubility. Furthermore, the mild process controls make CESS suitable for chemically unstable molecules, which can present a challenge when using mechanical methods such as milling. A final key advantage of the technology is that CESS produces pure drug particles, totally free from excipients. This imbues the freedom to choose which excipients to add during formulation based on the desired administration, without the need to worry about particle size. Although it was not the initial intent of the technology, CESS can also be used to access alternative administration methods and clinical indications. Fine control over the particle size of products enables the exploration of different drug delivery applications with the same API. For instance, 10nm particles are great at crossing the blood–brain barrier and could be administered transdermally. On the other hand, larger 1µm particles have excellent surface properties when compared to milling, and are more suited for respiratory administration. Nanoform was founded to solve the mounting problems with dissolution and bioavailability that drug companies face. The use of CESS uniquely equips Nanoform with the means for achieving this mission, and the company is committed to constantly improving its own capabilities and methods. There is a need within the industry to handle potent APIs, and to this end, Nanoform is investing in an expansion that will result in a new GMP facility capable of handling SafeBridge category 3A chemicals by the end of 2019. As this expansion progresses, the company is also looking at quality by design improvements for its manufacturing processes. An area Nanoform is highly interested in pursuing is the relationship between where a molecule sits in chemical space and its solubility and bioavailability. The company recently brought on board Jukka Corander as the head of artificial intelligence (AI). Alongside recent work with the Wellcome Sanger Institute in Cambridge, UK, he is currently professor of biostatistics at the University of Oslo in Norway and professor of statistics at the University of Helsinki in Finland. His field applies a Bayesian approach to machine-learning algorithms to get the maximum benefit from limited data sets such as Starmap. The idea is to use Corander’s expertise to quickly identify the right particle properties for a given client’s formulation, in order to deliver consistent materials that overcome challenges a client may be facing. CESS presents a bottom-up approach for producing nanoparticles with an identifiable crystal form, avoiding the use of excipients and increasing the dissolution rates of poorly soluble aqueous APIs. Nanoparticles have the potential to make a big impact in drug discovery, providing a route to market for the roughly 40% of interesting lead compounds that suffer from low solubility. With a helping hand from AI, Nanoform aims to delve further into the processes that enable formation of superior nanoparticles. In doing so, Nanoform hopes to help pharmaceutical companies reduce attrition rates in the development of exciting new medicines. NanoformNanoform Finland Limited is a nanoparticle medicine enabling company that works with global pharma and biotech partners to enhance their drug molecules through its nanonization services. 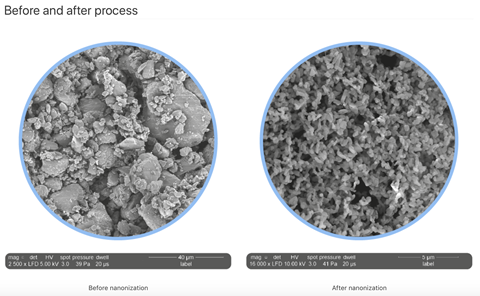 Nanoform’s Controlled Expansion of Supercritical Solutions (CESS) technology produces nanonized 'designed-for-purpose' API particles, as small as 10nm. This enables poorly soluble molecules in the pharmaceutical pipeline to progress into clinical development by increasing their rate of dissolution and improving their bioavailability. 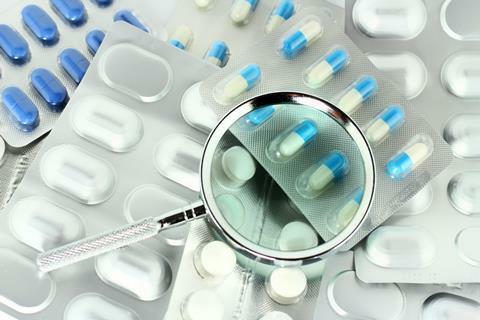 The unique technology also provides novel opportunities in diverse value enhancing drug delivery applications.